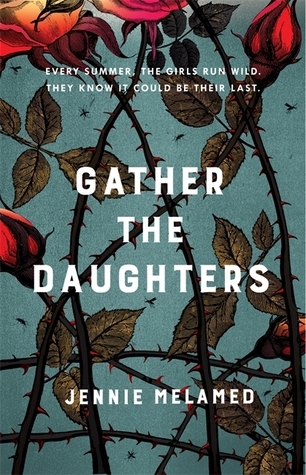 Gather The Daughters by Jennie Melamed is the story of a group of girls living in a strange, ultra-patriarchal religious cult on an isolated island. The descendants of 10 families who came to the island several generations ago to escape the 'wastelands', as they call the outside world, the girls are married as soon as they reach puberty. Birth defects - as you might expect in a community with such a small gene pool - are common. By the time adults reach their 40s and are no longer needed for breeding or childcare, the usual practice is for them to end their own lives by voluntarily 'drinking the final draft' - although a chilling rhyme sung by the children suggests that refusing the poison is not an option. Most unpleasant of all, the abuse of prepubescent girls is practised as, essentially, a form of birth control. The story is told from the point of view of several of the island girls, but I didn't find their voices particularly distinctive. Only Janey, who has been starving herself to delay puberty and avoid marriage in a bid to retain some form of control over her life, felt like a fully realised character and there were times when I forgot who was who, which isn't something I usually struggle with at all when reading fiction with multiple points of view or narrators. Melamed's prose, however, is richly descriptive and I can't fault the vivid picture she creates of the island itself, miserably thick with mosquitoes all summer, or the well-chosen details of the islanders' strange life of isolation. I was particularly struck by the image of the island's church - in which the islanders, of course, worship their ancestors rather than any god - which was poorly built from stone too heavy for the land and consequently sinking into the mud. Rather than knock it down and rebuild it more efficiently, the islanders simply add more stones to the walls to restore its height. Although Gather The Daughters had promising elements, I didn't really feel it delivered overall. I was at least halfway through the book before I felt it picked up any real momentum - an awful lot of the book is essentially scene-setting and 'patriarchal cult controls women and shuts off from the outside world' is not really anything new in fiction. I also found the ending anti-climactic. Moreover, we only hear from the girls who have lived on the island all their lives (one has a vague memory of a single moment of being a toddler on the mainland but it's fleeting and unclear) and not from any of the rare women who are not descended from the original settlers but joined the community more recently from the outside world. What was it that brought them to this isolated community ravaged by mosquitoes, sky-high infant mortality rates and death by 40? Were they sold some sort of Amish-style old world utopia, or a forward-thinking hippy commune? Or were they simply coerced by controlling husbands? It's clear fairly early on that the outside world is not the wasteland it's claimed to be, and certainly at least one pair of incomers consists of a husband who apparently sees his new life as a licence to abuse little girls. Frankly, I'd like to have heard from his wife. Gather The Daughters held my interest but ultimately disappointed me. I don't think it's spectacularly memorable and there are better books than this with similar subject matter. My thanks to the publisher, Tinder Press, for sending me an advance copy of this book for review.